Michelle’s Third Birth: Unmedicated Hospital Birth, Doctor Nearly Missed! 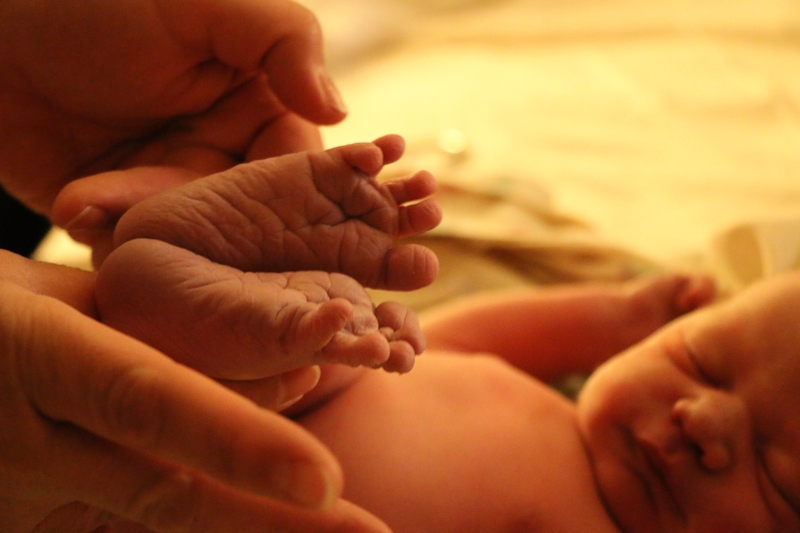 I’m SO excited to share this birth story from one of my HypnoBirthing/Doula clients, Michelle. It was every bit as amazing as it sounds! I was so glad to be there with her and her awesome husband! I’ve always been curious about natural birth. My husband and I decided on having our babies in the hospital – in case of emergencies. I was not totally against epidurals but always wondered what natural childbirth was like and if I could do it. With my firstborn daughter I was induced and got a walking epidural. With my son, I went into labor naturally but had terrible back labor and was unable to get an epidural because hospital policy wouldn’t allow me to be checked in until I had progressed. I’m not going to lie – it was not pretty. I was not prepared for no epidural. When I finally got the epidural my son was born half an hour later. He had trouble breathing and had to be whisked away by the nurses. Even though we were blessed and everything was fine, it was disappointing and lonely to have to sit there and wait hours before the epidural wore off so I could go see my baby. After that experience, I knew I didn’t want an epidural and I didn’t need one. Even if I did end up changing my mind – I wanted something to help me through labor. Even though you can’t control everything in birthing, I vowed to take ownership of my own birthing experience. With my third child, I found a doctor who was supportive of natural childbirth and asked her if there was a method she recommended. Without missing a beat, she recommended Hypnobirthing. I was amazed by the videos of women giving birth so calmly and decided that regardless of the outcome I would commit myself to giving it a try. My husband and I took the class from Fiona and hired her as our doula. I went into labor around 9 pm – only an hour or two after grandma and grandpa arrived to help with the other kids. I could tell it was real labor because the contractions just felt a little ‘crampy’. Physically the labor progressed much like the labor with my second child but it was a much better experience for me! My contractions were 10 minutes apart all night long. My husband supported me through the night. We snuggled and napped. I was so relaxed in my meditation during early labor that I was able to slip into little power naps between surges. It was amazing and helped stave off exhaustion. My husband helped me labor in the bathtub in the early morning hours. We texted Fiona before midnight and then again in the early morning. We decided to ask her to come around 7 am. I sat on my birthing ball at home and Fiona and my husband took turns putting a hot rice pack on my lower back with gentle pressure. This saved me from the back labor that for me could be very sharp and intense. I was able to focus on really relaxing and letting my body do the rest. Fiona gave me gentle reminders to relax my face and words of encouragement. My husband really loved having Fiona there because it freed him up to tend to essential tasks that came up and know that I was taken care of. They cooperated really well together and she was always sensitive about when to step away and let him fulfill his role as my main support person. Around 11:30 am the surges were so intense that I started moaning so we went to the hospital which was very close to our house. I was dilated to a 7 and the nurses commented that I was “to calm” to be in transition. The nurses quickly got my hep-lock in, Fiona got me a cool rag for my forehead and the doctor was on her way. I really understood what people meant by “going deeper into your birthing body”. The closer I got the more my mind turned inward on my body and I had trouble paying attention to what was going on in the room. The nurses all followed my birth preferences because my doctor told them to on the phone (it really pays to have a doctor who supports your preferences!) By the time my husband finished filling out the paperwork the baby was ready to come! The pressure was really intense, but the doctor wasn’t there yet. This was the hardest part for me and Fiona told me to do my relaxed breathing through surges – which I really struggled to do. It was a little bit like holding back a truck. We all knew my babies come fast. I asked Fiona to “just get a doctor!”. She hopped up and talked to the nurse who stated that the doctor was just two minutes away. Okay. I could do that. A few surges later the doctor came whisking in and we were ready to push. I was instructed to hold my breath and push. I pushed once with no success and a brief drop in my baby’s heart rate. We realized I was in a bad position and so we repositioned and I tried again (with no breath-holding this time). One long push and my daughter, Lillian Elyse was born at 12:10 pm and was 6 lb. 6 oz. I was very lucky I didn’t need any stitches and I was surprised that there was no pain at all during the delivery. She was so tiny and sweet! Just perfect and calm – she didn’t cry very much. Fiona took some pictures and helped facilitate skin-to-skin and breastfeeding right away like we had talked about. It was wonderful to have that time to bond with my baby. Lilly nursed and snuggled Mom and Dad for good hour after the nurses cleared out. I was surprised how elated I felt after giving birth naturally. For me, it was freeing to be able to walk around and take care of myself or take pictures soon after giving birth and I felt very empowered, calm and in control of myself the whole time. I was so overjoyed to have a better birth experience and really be able to concentrate on welcoming our sweet baby into the world with love. I recommend getting lots of support and picking a system that will work for you. I loved the HypnoBirthing method and having Fiona as my doula and would do it again in a heartbeat! !